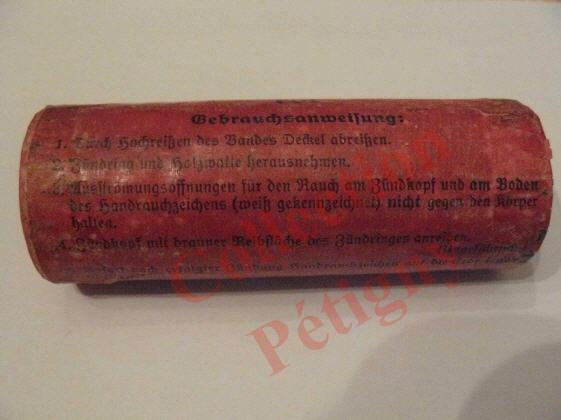 Description: This signal is included as an example of many German colored smoke signals. 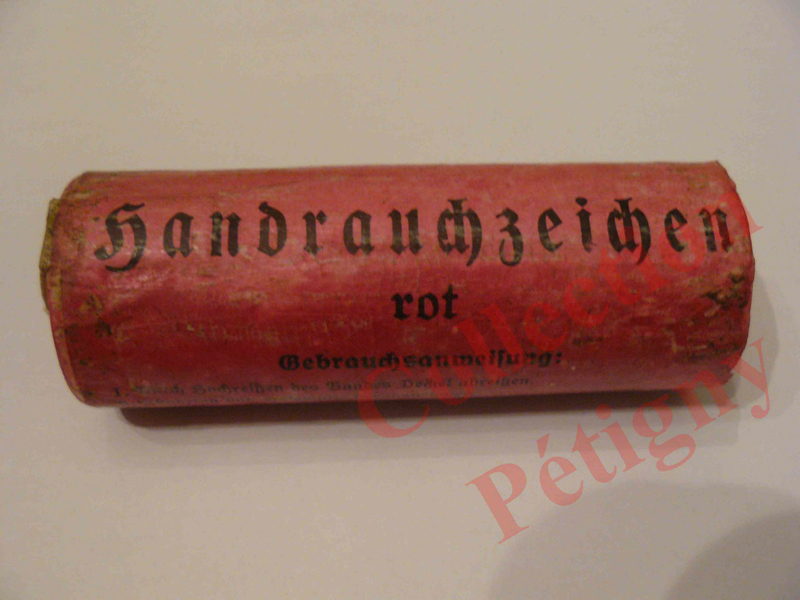 It is a cardboard cylinder with a cardboard pull tape lid at the fuze end and a glued in cardboard disc with an emission hole at the other end. 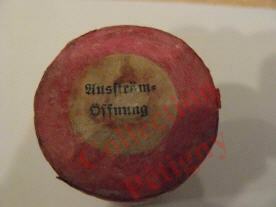 The whole signal is wrapped in red parrafined paper upon which the name and instructions are printed. Beneath the pull tape lid is a cardboard striker ring, one half the top side of which is coated with a red phosphorus abrasive mix. A paper wad separates this and the match head. Beneath the match head is a cardboard inner cover and a wire screen. 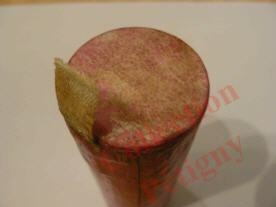 A perforated metal cylinder containing the quickmatch sheath is partitioned in the middle by a cardboard disc which is impregnated with gunpowder and has two diametrically opposite holes in it. At the emission end is another wire screen and the cardboard disc with a tissue paper covered emission hole. Operation: By striking the striker ring on the match head the quickmatch is ignited. This burns its entire length and ignites the gunpowder disc which is in direct contact with the inflammable smoke mixture. Smoke is then emitted at both ends of the cylinder. The signal may be placed or thrown. Its primary purpose is as a signal from the ground to an air observer. 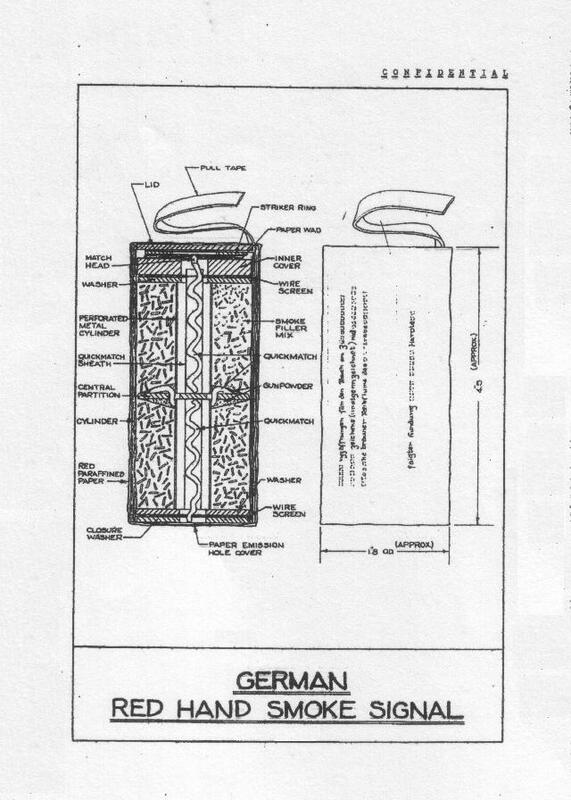 Remarks: German smoke signals numbers 350, 160, and 80 which are orange are analogous to this signal but differ in some respects. There are also similar signals in yellow and violet. All photos above © Ludo. 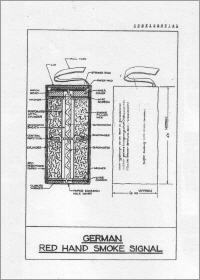 The one on the photo was to be used before 29-02-1944, revised Januari 1940.